His father was also a farmer and he worked for him when he left school. At 15 he became an apprentice turner for two years until there was an apprentices' strike which brought about the end of his engineering career. He went back on to the land at Winwick and then came to Westhoughton, first taking up the tenancy of Hoskers Farm and then buying Eatock Farm at Daisy Hill. During the War he had a milk round in Westhoughton, doing his daily deliveries with a horse and cart. After the War he sold Eatock Farm and with it the milk round. In 1966 he left farming for good, giving up Hoskers Farm and moving to Church Street. At the time he considered moving away from Westhoughton to retire in Torquay, but decided not to because of his commitments as a Councillor and because his married daughter lived in Westhoughton. Represented Hulton Ward from 1958. He served on nearly every Council Committee, was a Governor of Rivington and Blackrod Grammar School and a past Chairman of Westhoughton Conservative Association. In his year as Chairman his appeal was for Wingates Band which raised £1,400. 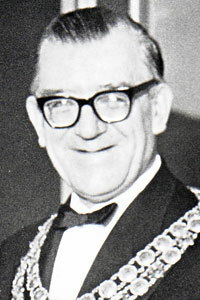 Speaking in 1968, celebrating 10 years as a Councillor, he said "It was one of my greatest thrills. Everyone in Westhoughton was wonderful when it came to raising money for the band."